Reliance Jio has come up with utmost benefit feature to all users while they are being luring with more offers from other teleco’s in the market. As of the news, JioLink is Jio’s 4G WiFi router service, it is targeted for indoor usage in homes, shops, offices and malls. 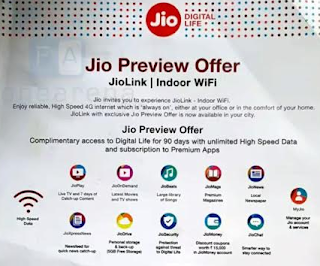 JioLink, Jio has revealed three plans which begins from Rs 699; Rs 2099 and Rs 4190. Rs 699 plan, users can get 5GB 4G data per day. Once the data limit is exhausted, the speed shall be reduced to 64 Kbps. Under Double Dhamaka, Jio has bundled 16 GB data extra for this plan. This means that users can now get total of 156 GB for 28 days, by paying Rs 699. There are no SMS included in this plan. Rs 2099 plan, users can get 5GB data per day for 98 days. In this plan, the user can get 48 GB extra for 28 days, which makes 538 GB of data for 90 days. Remaining terms and conditions are the same.